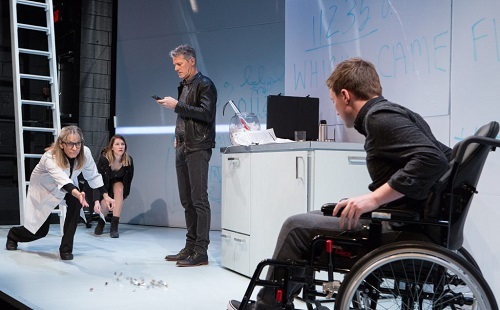 In Sequence, onstage at Tarragon Theatre, two separate narratives play out in the same space, at the same time, exploring the same themes: science and faith, luck, coincidence and probability. A mathematician confronts a man famous for a twenty year streak of winning Super Bowl bets on the flip of a coin; a fundamentalist Christian confronts a stem cell geneticist working on a cure for her own degenerative disease. The stories never intersect, but they have unlikely — one might say improbable — details in common. Tarragon’s set design and use of space is elegant and inspired. A ladder and a rolling cabinet, both white, are adorn either side of the stage. The only other set pieces are two backing partitions covered in white board, used by the scientists to explain and explicate their theories. At the beginning, the stage appears to be divided so that each story takes place in one half. As the play progresses, the narratives intrude further into each other, to the extent that two actors will be playing around the frozen bodies of the other two. This staging is interesting to the eye and forces the brain to draw comparisons between the character’s perspectives. Theo’s (Kevin Bundy) perspective is that he is the luckiest man in the world, which he publicly capitalizes on without revealing that his luck is a double edged sword. Cynthia’s (Ana Jane Markus) perspective is that Theo is an arrogant sleazeball who is somehow accessing an arcane force based on an integer sequence — and that hopefully she can use his power to benefit her own unfortunate circumstances. Meanwhile, Dr. Guzman (Nancy Palk) is working alone in her lab, using her familiarity with the space to augment the 8% of her sight left from Retinitis pigmentosa, when a student, Adamson (Jesse LaVercombe) shows up. Adamson has scored so remarkably low on Guzman’s mid-term that she doubts it’s possible to be either bad luck or incompetence. She suspects he has purposefully answered every question wrong in order to gain access to her lab with malicious intent. Her fear is reinforced when he states that he believes everything is an act of God, even the accident that led him to use a wheelchair. Palk is a hilarious Guzman, dedicated to sarcasm almost as much as to science. She knows her visual disability leaves her vulnerable to religious extremists who value stem cells more than people, but she will keep doing it, albeit with protocols to entering her space. LaVercombe plays Adamson as if he thinks he’s courageous and strong-willed, unaware of how pitiable it is to watch him tossing a piece of his own spinal cord as if it were dice, believing God is speaking to him in the outcome of the flip. I do, however, look forward to the day when characters with disabilities can be played by actors with disabilities. Bundy’s Theo is slick and disturbingly familiar: a straight white cis man who is far more confident than his mediocre abilities warrant. He has no discernible skill, but everything works out in his favor — except that there is a dark side to his luck that he slowly reveals during his encounter with Cynthia. I hope this was a deliberate, if subtle, aspect of playwright Arun Lakra’s script: that straight white cis male privilege has the dark side of toxic masculinity. While Markus’ stage presence was certainly a match for Bundy’s, Cynthia was a harder character to parse for me. Her initial antagonism wasn’t fully paid off by the eventual revelation of her motivation. In both stories the science quickly became fantasy, but in hers the about-turn struck me as oppositional to women’s bodily autonomy. Yet, perhaps Lakra’s intention was to contrast the Cynthia story against Guzman’s determination to remain autonomous in the face of blindness. There were various juxtapositons between the two stories, including in props: Theo’s book on luck, the cover starkly imprinted with a ladder, set against Adamson’s ratty copy of the Bible. While I’m not sold on every detail of the plot, the ideas and structure of the show are delightful, philosophically engaging, and inventive, and the production elements are apt and stylish.